Olfactory Stem Cell Transplantation: An Effective New Strategy for Facial Nerve Damage Repair? While surgical intervention can aid the restoration of the severe facial nerve damage often encountered following temporal bone trauma , the poor functional recovery observed in some patients has prompted the exploration of additional therapeutic approaches. In the vein, researchers from the laboratory of Shinichi Esaki (Nagoya City University, Aichi, Japan) sought to assess the potential of olfactory stem cells, which can engraft and support axonal outgrowth after spinal cord injury [2, 3], as an autologous approach in the treatment of facial nerve damage. In their new STEM CELLS Translational Medicine article, the team establishes that transplanted neonatal mouse olfactory stem cells supported by a biodegradable gelatin hydrogel accelerate and enhance recovery in a mouse model of facial nerve damage . Derived from the olfactory mucosae of new-born mice, the olfactory stem cells under assessment expressed neural stem cell markers, exhibited long-term self-renewal capacity, displayed multipotential differentiation propensity, and also secreted a range of growth factors and cytokines known to promote nerve regeneration (e.g., GAS1, IGF-BP2 and 3, sTNF‐RI, TWEAKR, NGF). To test in vivo efficacy, the authors transplanted olfactory stem cells into a nerve injury site in an established facial nerve damage mouse model and applied a biodegradable hydrogel sponge (MedGel) to aid olfactory stem cell retention and survival and to diminish any detrimental effects derived from the local tissue microenvironment. Encouragingly, this combination strategy promoted a higher level and duration of accelerated recovery when compared with olfactory stem cells alone, whose influence lasted only a week, and permitted an increase in peripheral nerve function and the number of regenerated nerve fibers. Given the easy-to-harvest nature of olfactory stem cells and their proven therapeutic potential in a mouse model of nerve injury, the authors anticipate that this novel therapeutic strategy will soon reach testing in human patients. However, the authors do note the requirement for further investigations to further explore the interplay between the cytokines, growth factors, and other neurotrophic factors expressed during facial nerve damage recovery, and perhaps begin the development of a cell-free approach for facial nerve damage repair. For more on the enormous potential of olfactory stem cells and further stem cell-based therapies for the repair of facial nerve damage, stay tuned to the Stem Cells Portal. Chang CY and Cass SP, Management of facial nerve injury due to temporal bone trauma. American Journal of Otolaryngology 1999;20:96-114. Xiao M, Klueber KM, Zhou J, et al., Human adult olfactory neural progenitors promote axotomized rubrospinal tract axonal reinnervation and locomotor recovery. Neurobiology of Disease 2007;26:363-374. Xiao M, Klueber KM, Lu C, et al., Human adult olfactory neural progenitors rescue axotomized rodent rubrospinal neurons and promote functional recovery. Experimental Neurology 2005;194:12-30. 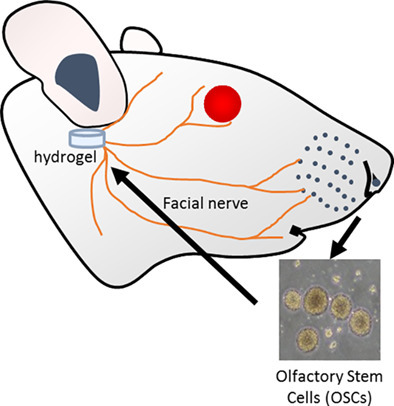 Esaki S, Katsumi S, Hamajima Y, et al., Transplantation of Olfactory Stem Cells with Biodegradable Hydrogel Accelerates Facial Nerve Regeneration After Crush Injury. STEM CELLS Translational Medicine 2019;8:169-178.